Ghee or butter ......... 2 tbsp. Red chilli powder .......1/2 tsp. 1. Soak the rajma and urad dal, preferably overnight or at least 6-7 hours and boil it. 2. In a pan, take a little oil and fry the onion till golden brown. Add ginger paste, tomato, green chillies and a little water to cook. Let it cool and grind it. 3. Add the boiled dal to the onion paste. Add salt, turmeric powder and about 1 or 1 and half cups water and let it simmer. 4. Now add the cream and mix it well. 5. In a small pan, heat the butter or ghee, add the crushed garlic, saute it and off the gas. While the ghee is still hot add the garam masala and red chilli powder. Mix the tempering to the dal. It is my hubby's favourite too.. Now you have the recipe and you can try at home too. This looks so wonderful.. a good north Indian recipe for me to try out. What spices (in the garam masala) did you use to temper the daal ..whole or ground? Thanks for liking dear.. do make it and I have used ground mix spices. 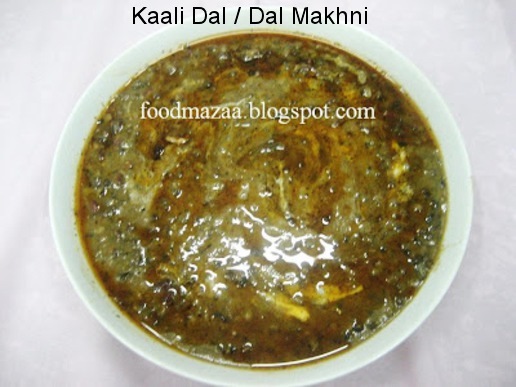 I've never made Dal Makhni.. this looks delicious. I loveeeeeeeeeee it. So you live in Brazil? Nice tempting flavors !! looks so tasty !! Thanks for linking to the event !! Appreciate it !! Thanks Sravs.. it is very easy recipe.